Rosie Adediran (centre) creates her modern nursery rhymes with parents and kids. An arts project that has grown from humble beginnings at a family centre in Hackney has launched its own YouTube channel – featuring original nursery rhymes created by professional musicians, parents and children. 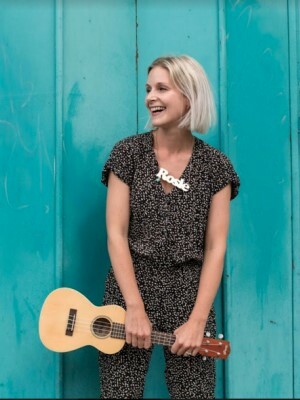 London Rhymes, founded by singer-songwriter and early years specialist Rosie Adediran, began life in 2015 at Ivy Street Family Centre in Hoxton. Adediran and her band wanted to create positive, catchy songs for modern families, and initially collaborated with parents and children from Ivy Street and the Hackney Playbus group. 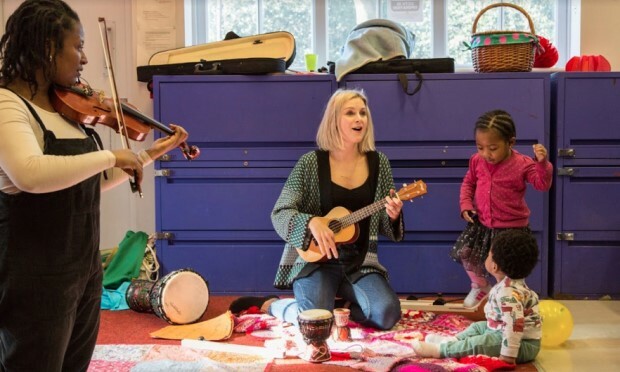 With the help of youth charity Creative Futures and funding from Arts Council England, the project has since been rolled out at children’s centres across the capital, and now boasts a 40-song repertoire. Last week, London Rhymes launched its own YouTube channel, which the team hopes will provide an antithesis to the garish visuals and grating music found in other popular children’s songs – *cough* Baby Shark *cough*. Rosie Adediran is also known as Mama Sings. With tracks such as ‘It’s Nappy Time’ and ‘Let’s Be Friends’ – recorded in Hackney – the sentiments are rooted in the experiences of modern parents. The videos have all been lovingly animated, in a muted style to avoid sensory overload, by London and Paris-based illustrator Claire Fauché. Some have already been viewed more than 30,000 times. Adediran, who also releases music and publishes a blog under the name Mama Sings, said: “Writing alongside parents is what makes London Rhymes so special. The project is based on extensive research which has found that singing can help parents bond with their child, build confidence and have a positive effect on mental wellbeing. According to a study by the British Journal of Psychiatry, mothers experiencing post-natal depression reported an average 35 per cent drop in their symptoms after taking part in singing workshops for just six weeks. A report by Creative Futures collated a wide body of evidence which demonstrates that music can improve children’s speech and communication, social skills, coordination and numeracy. The charity creates bespoke music and arts projects for disadvantaged children and young people across London – with a focus on introducing creativity to their lives at the earliest opportunity.